War, is something that most people on the street are familiar with in the sense that they hear about it, they see it shown on televisions and being discussed all the time. But even this sort of exposure does not bring home to us the real effects of war on the people involved. The truth is war in theory represents a fight between two nations or factions for us and we do think about the people, places and property that get affected. Only when you look at pictures that show you the extent of damage do you realize the true damage. Sometimes it makes you wonder what photography techniques have to be used to get the right pictures, when you look at picture that make a great impact. But did you know war has a profound effect on the ones that are the most personally involved in it? Yes! We are talking about the soldiers here. They are the ones who are actually out there and facing everything that is so wrong about war. One may argue that this is a choice they make; while this may be as it may but war ravages more than just lives and property, it ravages the psyche. In a way that is really impactful, Photographer Lalage Snow did an artistic study on this to show the effects of war on the faces of the soldiers who are actually out there. You will be stunned at the changes in the faces of the people who have survived the war. The photographer is as of now at Kabul, Afghanistan. This study will use art to tell you how British soldiers who were part of this war looked before the war, during the war and after the war. 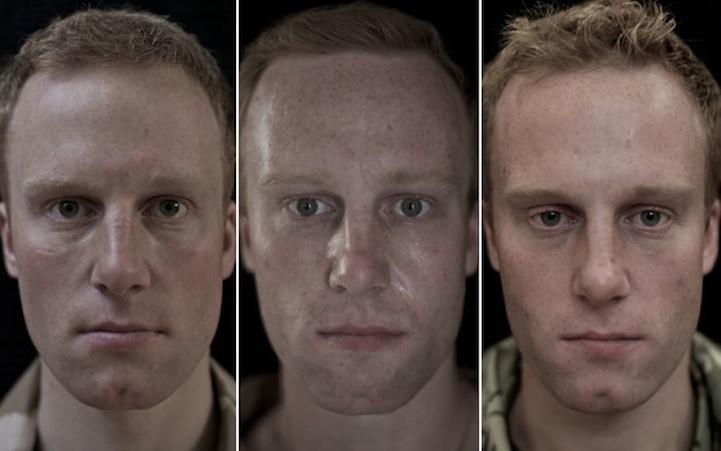 The changes in faces of these soldiers tell their own tale. You can see the innocence and confidence being changed into outrage and aggression and thereon to weariness and fear once the war is over. The impact is more so since the color in the photos have been kept to the minimum. In fact you may wonder at how close these are to some fabulous black and white photos you have seen. In the images given here you will see their age and experience does not matter, it is their expressions and the changes in their faces that tell us the whole story. We all know that in life what we see, what we feel and what we experience somehow makes it to our faces and the changes are wrought even if we don’t see or feel them at first. That is the case with these really courageous and patriotic men who went through a transformation that few of us can even imagine. Not only will it leave an impression on the face but also the psyche. The intention of Snow behind this series was not only to show brave and courageous these soldiers have been in facing everything that they did but also in the transformation they had to go through psychologically. The fact is we honor soldiers and revere them but we never think beyond that. The whole point of this project was to make everyone aware of the effect of war and witnessing all those horrors of war can have on the men who survive it. The project is aptly named “we are not the dead” and tells us that we need to think of all that these men went through and work at ensuring that others do not have to. One can almost see the tears shed and unshed of not only these men but also their families who have to deal with the fallout of war.